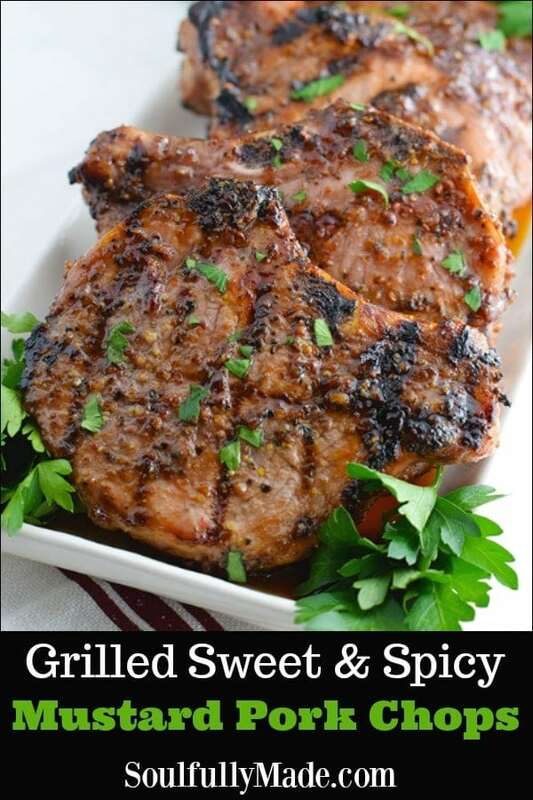 A little sweet and a little spice blended with tangy mustard lends to the most moist and delicious Grilled Sweet and Spicy Mustard Pork Chops. Fire up your grill and add this smokey goodness to your menu just in time for grilling and BBQ season. It’s BBQ month and there are so many ways to enjoy this time honored tradition. The smokey flavor that happens when you cook over an open flame is just hard to beat. We love simple recipes with lots of flavors at our house. Which is one of the reasons we love to grill. You can keep it simple and have deliciousness! 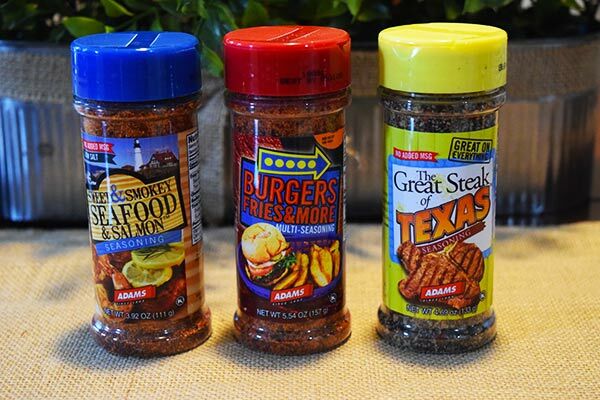 My friends over at Adams sent me 3 spice rubs to try for BBQ Week. Adams has been committed to high quality service and products for over 125 years. You may be familiar with their extracts, but they have delicious spices and rubs too! Today I am using the “The Great Steak of Texas” Seasoning. 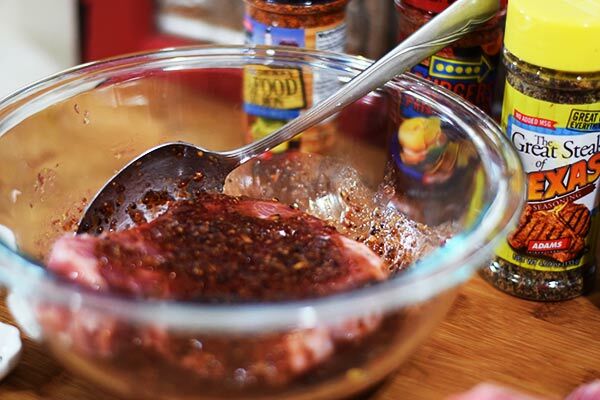 This seasoning is packed with lots of flavor and I think you will find yourself using this one more than just on steak! Like on these big juicy PORK CHOPS! 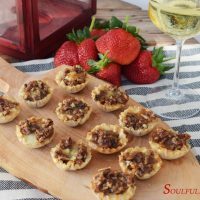 I along with a few other bloggers are bringing you some new recipes to try on the grill this season. Look for these in your local stores or head over to visit Adams on their website and social media channels. I don’t know about you but easy recipes are always a big win for family dinner time! So let’s jump right in to making these! Step 1: In a bowl large bowl, mix up all the ingredients to make the marinade. There will be extra. Go ahead and keep that. You will use that to coat those chops again while they are on the grill. Step 2. Take each pork chop and roll them around in the marinade. Use the spoon if you need to and coat them good. Shake off excess and put on a plate to transport to grill. Step 3. Heat grill on high heat to 350 degrees. Carefully place them on the grill. Mop addition marinade while on grill. Cook for 7 minutes or so and turn over. Mop on more marinade and cook this side for 7 minutes or until done or at least 145 degrees F.
It’s that easy. So fire up those grills and let’s get dinner (or lunch) started! 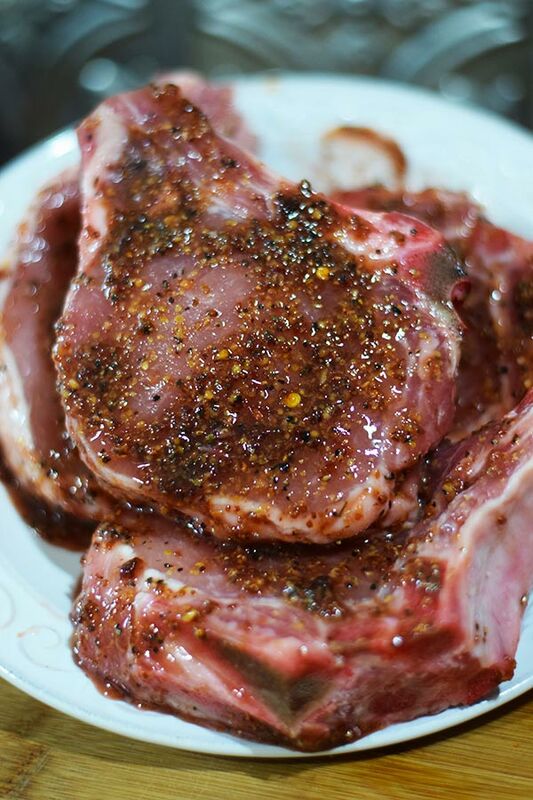 Just 15 minutes until tender juicy porks chops will be ready! Don’t forget you can enter to win some prizes, so make sure you read all the way to the bottom of the post. Set grill to high heat and let warm up for 5 minutes to about 350 degrees. Lightly salt bone in pork loin rib pork chops to taste. 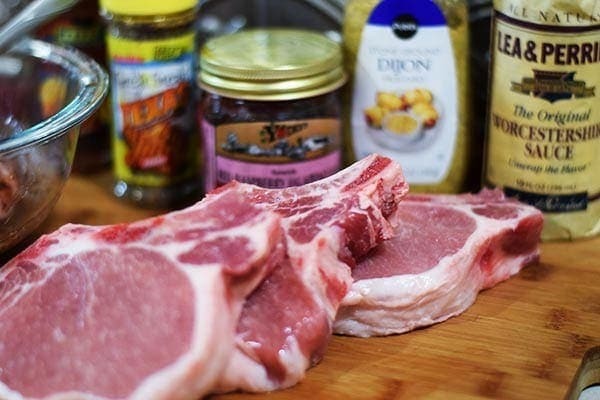 Place pork chops on grill and mop on more marinade. Cook for about 7 to 8 minutes and turn over. 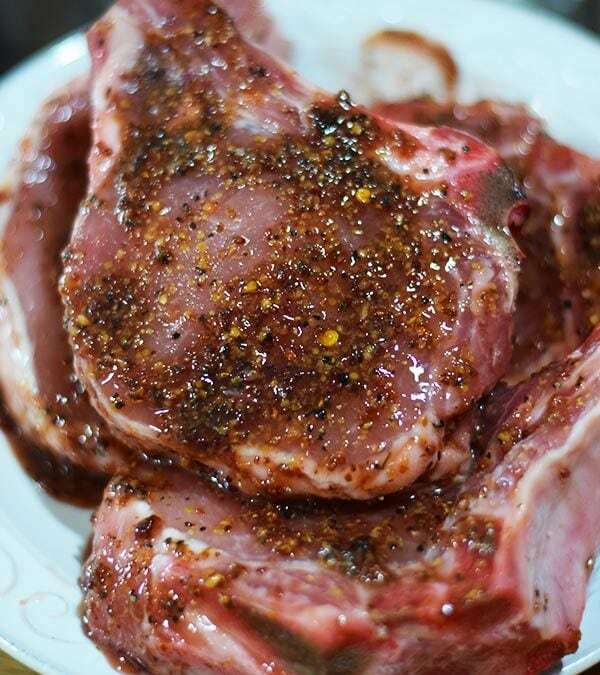 Mop on remaining marinade and grill for 7 to 8 minutes or until done. This week you’ll enjoy more than 70 recipes from more than 20 bloggers. ***Disclaimer: Thank you to #BBQWeek Sponsors Adam’s Extracts, Michigan Asparagus, and Not Ketchup for providing the prizes free of charge. 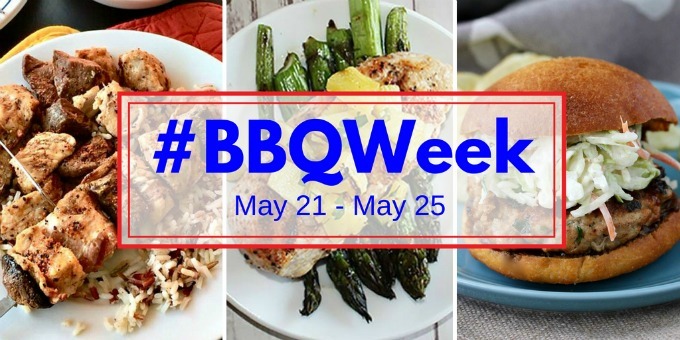 These sponsors also provided bloggers with samples and product to use for creating #BBQWeek recipes. All opinions are my own. You can find this at Meal Plan Monday and Weekend Potluck! 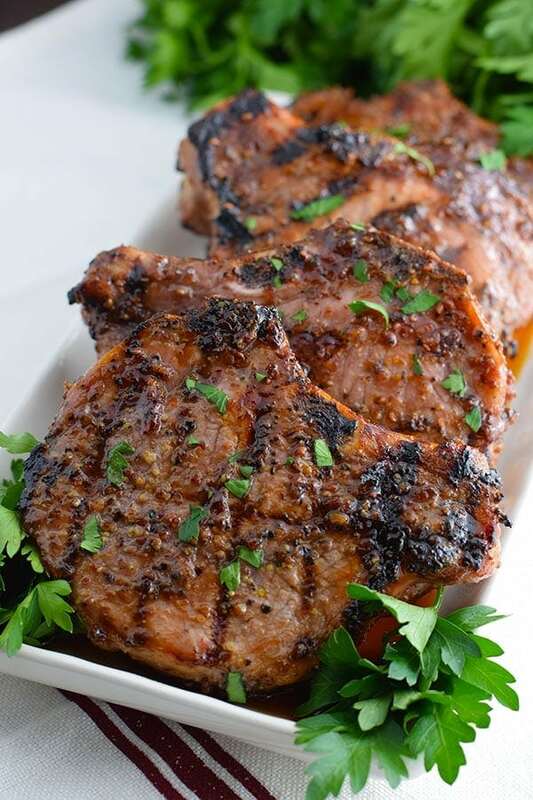 grilled pork chops are a favorite around here! These look delicous. They look like some killer chops! I love that marinade with the Adams rubs. So much flavor! Thank you! We love to grill chops! 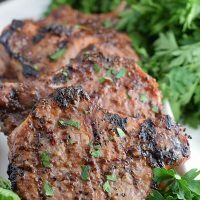 This marinade is so easy and flavor packed! These are so gorgeous and juicy. 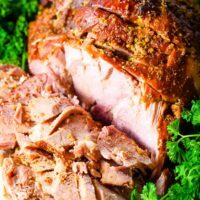 I am insanely obsessed with pork on the grill! 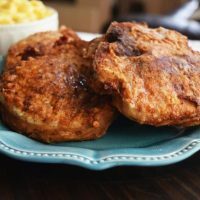 My husband loves pork chops and mustard so I know he’d love this recipe. It will be on the menu soon! Thank you Ellen! I hope he loves them as much as my family does! Goodness friend! I can’t think of any way you could have made this anymore delicious. I want to lick my screen. Definitely putting this on my to-make list. Great flavor choice! That crust on those pork chops is amazing. 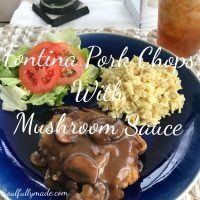 Just love this recipe and I’m a huge pork chop fan. Perfect for my Memorial Day BBQ. Thank you Eileen! I love pork chops too! And they will be perfect for the grill this weekend! I hope you love them! 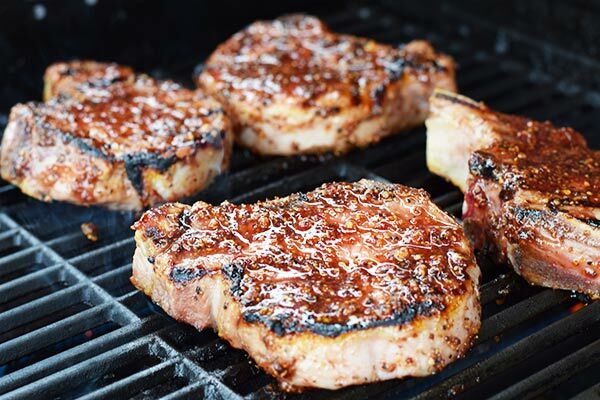 These pork chops look so juicy and delicious. I look forward to making them this summer. Thank you Liz! 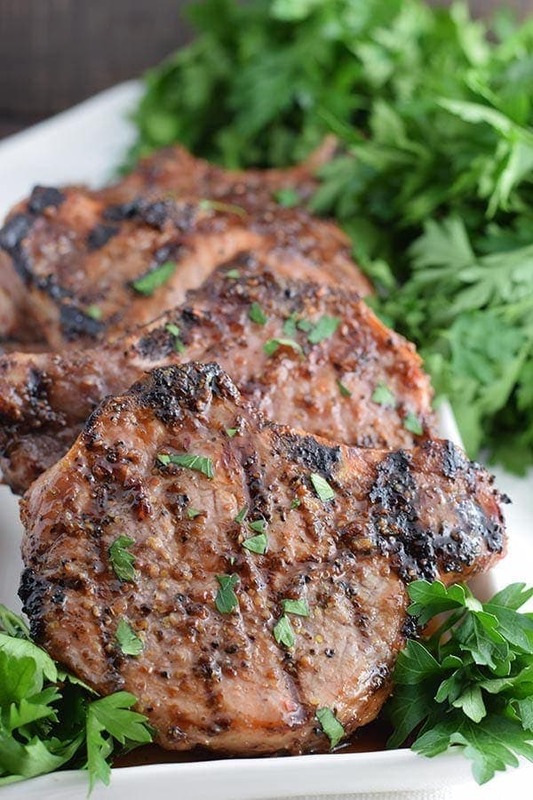 Nothing better than a juicy grilled pork chop! They look sooooo good. I think I’m adding this to next week’s menu. Thank you Nichole! I hope they make their way on to your menu! Lots of flavor and an easy meal too! These chops sound out of this world. I need these in my life! Oh lordy lordy…just hand me a fork already! I want to dive right in!!! Definitely need to put these grilled chops on the menu! They look awesome! Jolene, I agree! Super easy for a summer meal or really any time of the year! I love chops on the grill! A touch of spicy sweet sounds so good! I do too Cindy! And a little sweet and spicy is a perfect combo in my book!